Fists of Ham! : everything is bulky and shiny! everything is bulky and shiny! Like anyone who will proudly proclaim this fact about themselves, I've been a gamer since I was 4. The parents bought me an NES (at least I think it was for me) and it was pretty much all I did from then on. I spent most of my time indoors which probably contributed to my childhood weight problem and turned me into something between introvert and recluse. There was a time when this made me different, but sadly it almost makes you cool these days, like some kind of F'd up badge of honor. But I'm getting way off topic. 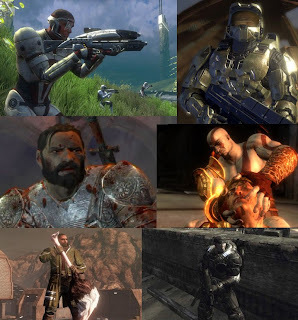 What I mean to say by bringing up my 19 year stretch as a gamer is that I've seen graphics change, go in and out of trends, and become incredibly realistic. I'm not as old as some gamers out there, but I've seen every major graphics innovation that came between these two games. From blast processing to pixel shaders, I've seen almost everything. 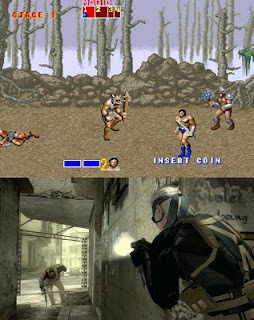 From game console to game console, there have been little similarities between games on certain platforms. Sega Genesis games had a little bit of a more "jagged" and dark look when compared to Super Nintendo games, which often had primary colors and softer edges. Compare Sonic or that awesome X-Men game to the old Final Fantasies or Mario World. Likewise, Playstation and N64 had their distinct looks, with.......now that I think about it, the same comparison. Harder and more mature versus family friendly. More than that, there were just little indescribable similarities between games on the same system. Without looking ,if you saw a screencap for a game in 1995, you knew what console it was. And more than just distinguishing consoles, this aided in giving developers the ability to create games that offered customers an eclectic selection. As we've gravitated towards more multiplatform games, with most major releases coming out for every system (now including PC), what we see more nowadays is general trends in art direction instead of just art styles that were largely dependent on hardware (Meaning, Sonic looked like X-Men because of the Sega). No longer system exclusive, these trends permeate almost every game. Instead of the openness of graphic design allowing a whole slew of art styles in games, it's created trend. Graphics effects become available to all graphic artists once they're released, after all. So now everybody has access to anti-aliasing, pixel shaders, bump maps, etc. Look at MGS4 up there. It probably uses them all. Here's the part where I turn on the Jeremy. These effects, when they come together, make every game look very very similar. Art direction can influence a game and make it distinct, but with similar graphics horsepower available to everyone, most artists max out their resources at roughly the same point and everything looks like this. Don't some of those screens actually look like they could have come from one game? It doesn't really help that space marines in power suits are really really in now. Look at these games. In recent years I've noticed that all games look really bulky, use way too much shimmer, shine and bloom, and while this is unrelated I can't help noticing just how much testosterone is in there too. It's like SpikeTV and Vikings had a child. A child which broke out of the womb using a hammer. What happened to the lean, mean look of games like Devil May Cry? Why hasn't a uniquely interesting fantasy world come around since Final Fantasy 10? You know, something that isn't Space Colony X or Fantasy Kingdom Y? Why does bloom have to be turned up so damn high? And are you afraid I won't buy your game if my main character isn't beefed up past the point of necessity? Does the buffness of any character do anything to contribute to whether or not you care about them? Who shot JFK? What I'm trying to say is that developers do not need to use every single effect available to them. Another way to put it is that adding bloom or shimmer isn't really a good thing just because it's one more effect (as opposed to 0 more). Use whatever tools you need to make the visuals you want, but don't just add something you don't need because it's there. Developers and specifically artists have more freedom than they've ever had right now. Use it to create something isn't boring when compared to games from 10 years ago. Your creation can not just be the sum of graphics technologies. The technology should enable, not guide.